Bristol’s favourite multi-instrumental trio Three Cane Whale has always been evocative of particular atmospheres and landscapes, both real and imagined. In the second half of the gig, the band unveil a series of world premieres in the form of films created by ten different filmmakers to accompany their live performance. These include works by feature-film director Brett Harvey, BAFTA-winning animator Emma Lazenby, installation artists Kathy Hinde and Reuben Knutson, TV director Mark Taylor, cinematographer Adam J Laity, acclaimed visual artist John Minton (who’s worked with Portishead and Get The Blessing, amongst many others), cutting-edge Finnish-based dance-filmmaker John Collingswood, award-winning scriptwriter and filmmaker Ollie Cullen, and ‘architectural’ animator Peter Northcott. 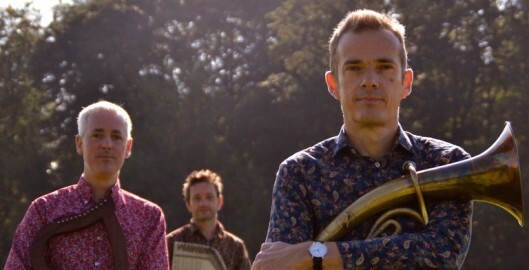 The gig also sees the launch of the band’s long-awaited first VINYL release (of the album Palimpsest, recorded at Real World Studios and produced by Adrian Utley), some brand-new as-yet-unrecorded tunes, and the continuation of their collaboration with the ‘Kelston Laureate’, aka poet Jon Hamp.